Wire grid works hard for you already. Make it work even harder by using these Chrome 4" Peg Hooks for Wire Grids! Display your hanging merchandise on these Peg Hooks and create more free space on your gridwall for even more displays! Hang your merchandise in an organized fashion on these peg hooks to create eye catching displays that will wow your customers. 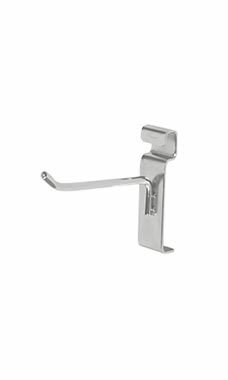 This Chrome hook will never lose its color and will match virtually any setting you put in in. In stock and available for shipping immediately. These hooks are excellent quality, durable, and yet so easy to use. They allow for fast set up and take down. Saves me so much time at my shows. And I love that they come in many sizes! everything was Ok,,very fast delivery will buy again today ! The chrome appears to have a lasting look.